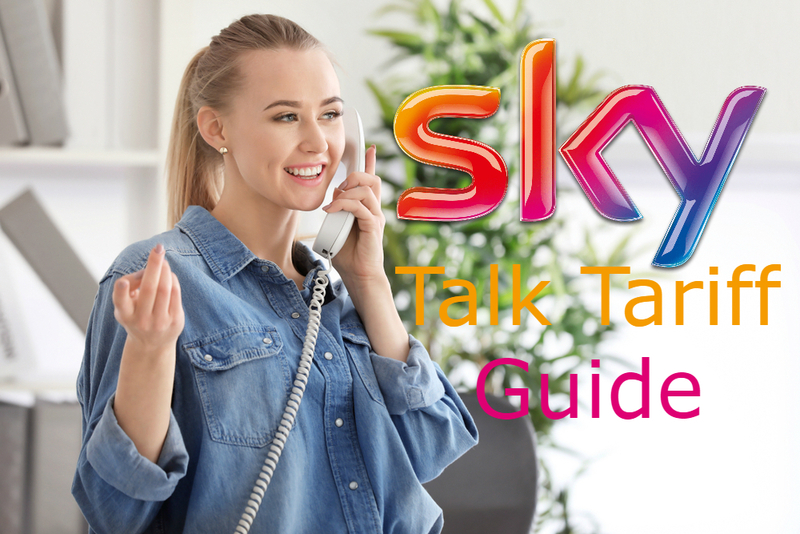 If you’re wondering about what Sky Talk is or you’re thinking about purchases the Sky Talk services but need more information about tariffs and more, you can follow the guide below to find out everything you need to know about the Sky Tark tariffs. Sky Talk is the home phone service provided by Sky. Their landline home phone services are usually sold with their broadband or TV services but it can be bought by itself if you would prefer to only have their landline services. When you sign up for their broadband services you are required to have their landline services fitted into your home to allow them to route the broadband into your home otherwise they would not be able to supply your internet connection. What are the Sky Talk tariffs? There are a few different Sky Talk tariffs including Sky Talk evenings and weekends, Sky pay as you Talk, Sky Talk anytime extra and Sky Talk international extra. When you’re picking a bundle with broadband or broadband and tv you can upgrade your Sky Talk package to any of the tariffs mentioned above, you will just need to speak with a member of the Sky Talk team. If you’re thinking about purchasing the Sky pay as you Talk tariff, you will not have to pay any extra for it per month (this is if you already have the broadband, you will have to pay for your broadband). You can call during the weekday daytime (Mon-Fri 7 am to 7 pm) for 15.5p per minute, to UK mobile numbers for 19.35p and to 084, 087, 09 and 118 number for 15p per minute plus service and access charge. If you would like to make calls in the weekday evening (Mon-Fri anytime after 7 pm and before 7 am) for 15p per minute, to UK mobile numbers for 18p per minute and to 084, 087, 09 and 118 numbers for 15p per minute plus service and access charges. If you would like to make calls on the weekend you will have to pay 15p per minute, to UK mobile number 18p per minute and to 084, 087, 09 and 118 numbers 15p per minute as well as the access and service charge. Calls to international numbers all have different charges per minute, to find this out you will need to go to the Sky website and check the charge for the country you will be calling. For the Sky Talk evenings and weekends extra tariff, you will have to pay £5 monthly for the service. If you would like to make calls during the weekday daytime (Mon-Fri 7 am to 7 pm) you will need to pay 15.5p per minute and you will have to pay 19.35p per minute if you would like to call UK Mobile numbers during this time. Calls during weekday evenings (after 7 pm and before 7 am) are inclusive as well as calls during the weekend. You will have to pay 15p per minute as well as access and service charge for calls anytime to 084, 087, 09 and 118 numbers. Calls to international numbers all have different charges per minute, to find this out you will need to go to the Sky website and check the charge for the country you will be calling. For the Sky Talk anytime extra tariff you will need to pay £10 per month and you call make calls all day Monday to Sunday inclusively with the package, including mobile numbers. If you would like to call 084, 087, 09 and 118 numbers you will need to pay 15p plus access and service charge. You can make international calls for 2p per minute to 22 destinations. With the Sky Talk international extra tariff, you will need to pay £12 a month. You will be able to make calls inclusively with the package all day Monday to Sunday. You will have to pay 15p per minute as well as the access and service charge for 084, 087, 09 and 118 numbers. You can make inclusive calls to 50 destinations with this package.